The Manfra group occupies several labs across the Purdue campus. Material growth and device fabrication is performed in the Birck Nanotechnology Center. III-Nitride materials are grown in a Riber MBE system while high-mobility GaAs crystals are grown in a highly customized Veeco GenII MBE. The Birck Center also has a wide variety of characterization and fabrication tools utilized by the group including facilities for photolithography, e-beam lithography, wet- and dry-etching, e-beam metal evaporation, dielectric deposition by ALD and PECVD, thermal annealing, surface profilometry, SEM, AFM, XRD, and TEM. Low temperature electrical characterizations are performed in the group's low temperature lab located in the Physics building. The Manfra low temperature lab performs electrical characterization of two-dimensional electron gases in GaAs/AlGaAs heterostructures. 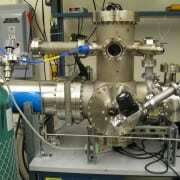 The primary focus is on research related to the fractional quantum Hall effect (FQHE). Quick characterization of material and devices is performed with a home-made 4K dipper probe equipped with a 2 Tesla magnet while more complete measurements can be made at 300 mK in a Janis He3 cryostat equipped with a 9 Tesla superconducting magnet. Installation of an Oxford Kelvinox He3/He4 dilution refrigerator with a 15 Tesla magnet is also underway which will allow lower (T < 50 mK) temperature examination of FQHE states and measurement of their energy gaps. The gallium nitride (GaN) MBE system is a Riber 32. The machine includes a load lock, a sample outgassing chamber, and a main growth chamber. 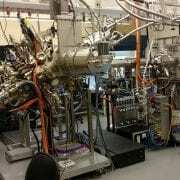 In the main growth chamber the system is configured with 2 gallium sources, 2 aluminum sources, a nitrogen plasma source, an indium source as well as a source for silicon. 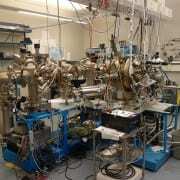 It is equipped with in-situ diagnostics including a reflection high-energy electron diffraction (RHEED) gun for measuring sample surface evolution as well as a residual gas analyzer. Projects include the growth of AlGaN/GaN and AlInN/GaN heterostructures both on polar and non-polar GaN substrates for intersubband device applications. In addition this system has been used to produce the highest 2DEG mobility ever reported in an AlGaN/GaN heterostructure. Our GaAs MBE is a Veeco Gen II system highly customized to improve overall vacuum quality and resulting crystal purity. Meticulous vacuum hygiene results in base pressure ~1x10-12 torr and all the effusion cells in our system are custom designed by our group in an effort to reduce the thermal load during growth. The lab also houses 2 ancillary vacuum chambers used for cleaning and characterization of components before loading into the MBE. One vacuum chamber has been specifically designed for gallium purification and mates with the MBE so that components can be transferred between chambers without exposure to air. This MBE system has recently produced 2DEGs with low temperature mobility in excess of 30x106cm2/Vs as well as 2DEGs exhibiting the highest excitation gap at ν=5/2 ever measured.